Before I start I have to disclose that I’m a big fan of Perry Marshall’s and of Bryan Todd’s. I’ve followed their teachings for years and recently attended their consulting accelerator seminar which was held in Rolling Meadows, Illinois. I am an affiliate and sometimes I make money when you buy products I recommend. That said, those things mean very little to me when it comes to reviewing products. The way I roll, you hear the plain truth. whether I like something or not; whether I like an author or not. 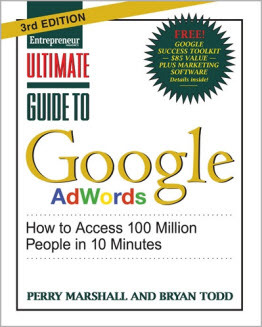 Perry Marshall and his associates teach a lot of things, but writing about and teaching Google Adwords is what made them famous and I venture to say, that for businesses of all sizes and kinds, the Ultimate Guide to Google Adwords is the most important non-fiction work of the last ten years. I can prove its importance with two points. In a recent issue of BtoB Magazine they covered their annual report of the top media companies in the United States. They list ad revenues for companies like Newsweek, The Economist, and Fortune Magazine. They include other media companies as well. 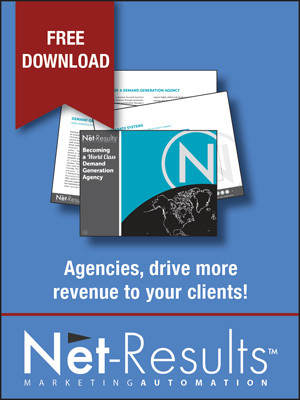 In this issue they reported that in 2011 three companies had ad revenues in the range of $60 to $200 million plus. They reported Barron’s ad revenue at $60.9 million, The Economist at $126 million, and Fortune Magazine at $204 million. In that same time period, Google’s ad revenue hit $22.9 BILLION. Traditional ad revenue models haven’t been eclipsed, they’ve been shattered – obliterated by what Google does. No business can ignore this and thrive. Let’s talk about Yellow Pages. I’ve always considered yellow page advertising to be the most important type for local oriented businesses like restaurants, lawyers, accountants, and plumbers. In 2011 the yellow pages book I received was two and a half inches thick and about eight and a half by eleven in size. The one I got a few weeks ago was less than an inches thick and about 4 by 9 inches. You’d have to be blind deaf and dumb if you don’t realize that things have changed. They are not changing. They have changed. And I haven’t even included a discussion about the mobile phone movement and smartphones. That’s why this book is important to businesses. It teaches you what you need to know to prosper in this new business order. It teaches you how to get customer inquiries using Google’s Adwords system. It’s written in plain English and it has key fundamentals on how to use the system correctly. Now let’s say that you’re already a Google Adwords advertiser. And let’s talk about that $22 billion dollars in ad revenue that Google brought in last year… It’s estimated that at least a third of that money is wasted by advertisers who pay what’s called the stupid tax in this book. Another third of it is wasted by successful advertisers who are spending more than they need to, but who are successful anyway… in spite of themselves… Because the Adwords is so effective it can work for many of you even if you don’t know what you’re doing. The Ultimate Guide to Google Adwords teaches you how to stop wasting money with some very simple practices. This Third Edition has a few new sections including information on Google’s display network, using social media, and creating USPs. It also covers re-marketing and local search. And if you’re not familiar with any of those terms you should be. I don’t have time in this summary to teach them to you. You should get this book. I’m going to give you one rich snippet out of the book. And it’s an easy one to understand. If you’re using Adwords, are you testing each of your ads against another??? In Chapter 4, where it teaches you to organize your ad campaigns properly, they teach you that Google doesn’t just rank your ads by what you’re willing to pay. Cost is just one factor. Google also counts your click through rates, otherwise known as your CTRs. If your click through rate is higher than your competitor’s, it’s possible to pay less for your clicks and still rank above your competitors. Why is that important? Well, Google also allows you to create more than one ad and to serve them alternatively so you can test your ads against each other for better click through rates. And once you determine a winner, you can dump the loser and use the winning ad as a control ad to test new ideas against. The idea is to test your ads against each other and create ads with increasingly higher click through rates in your business category so you can get more clicks for less money than your competitors. There are a lot of you using Adwords today that ignore this simple capability. If you’re one of them you’re wasting some of your ad spend and this is just one small idea that is offered in the Ultimate Guide. The book is appropriate for Google Adwords beginners OR for experienced pros. One thing for sure, it represents the knowledge of some of the best people in the industry. I can’t encourage you strongly enough to read this book. It’s changing people’s lives. Thanks for reading. 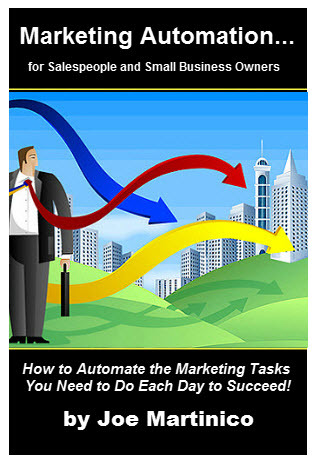 This is Joe Martinico with another Video Book Summary by MarketingAutomation.com. If you need help learning about or implementing marketing automation in your business. Or if you want to choose the right marketing automation vendor for your company, feel free to contact me via our website at MarketingAutomation.com or by calling me at (951) 313-7200. I've been intrigued by the use of automation in marketing since 1996. I started this blog to write, discuss, and review programs, applications, and ideas with others. If you'd like to contribute articles, ideas, interviews, reviews, or a how-to about a product or program, please contact me. I can be reached at (951) 313-7200.